Czechoslovakian wolfdog (also known in the US and in the UK as Czechoslovakian wolfdog) is a relatively young breed coming from the Czech and Slovak crossbreeding efforts, through Carpathian wolf and German shepherd. Czechoslovakian wolfdog was born in 1950, the mean ing. Karel Hartl, (head of the border guard dog Libějovice) to improve health, strength and toughness dogs used to protect the borders, inserting wolf blood into the breed. The main characteristics sought in these new entities have greater ability to learn and the skills needed to serve as a working dog; appearance and morphology were considered secondary to their resilience and their physical ability. In 1957, Ing Karel Hartl gave "continue" into the project. 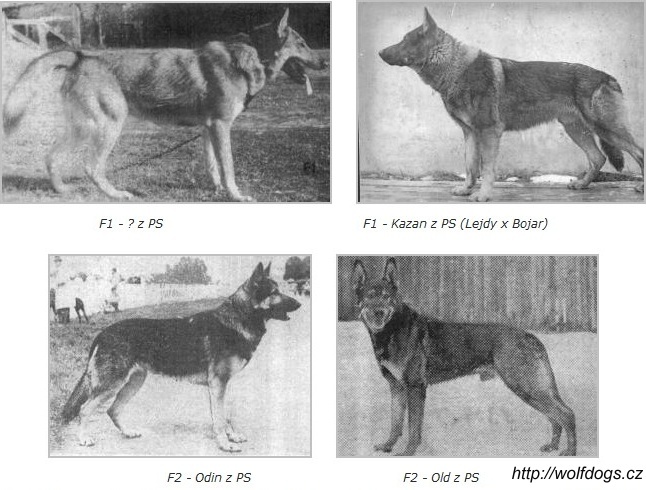 They were chosen two types of German Shepherds to fully meet the required characteristics of good breeding stock. The first dog was calm, obedient and well trained; The second was more aggressive, less submissive, but also well trained. Both were gray and no longer transmits its genetic heritage of times. The she-wolf Brita, who was one year old at the time, was brought to the border guards in Libějovice kennel of Border Guards to be mated. However, while she was warm, remain hidden, making the whole project to fail. In 1958, efforts were made to better manage the project and the heats of the wolf started on 15 March. On the thirteenth day of its races, the first German Shepherd was introduced in his pen. Wolf woman remained in his kennel, and when he approached, he attacked him on the neck. German shepherd unfortunately ran toward the exit. Woman attacked him again, even more emphatically, and tore a piece of skin as big as the palm of a hand at his side. The first attempt at mating between Carpathian wolf Brita and the first German Shepherd remained, therefore unsuccessful.